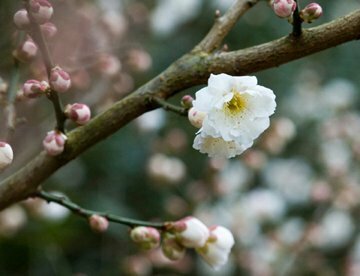 One of the earliest winter flowering ornamental trees to have in your landscape is Japanese Flowering Apricot (Prunus mume). The fragrant almond-scented flowers brighten the dark days of winter and can bloom from December until March. Colors range from white to pink to red with single or double blooms. The yellow fruit is more ornamental than edible. The tree prefers full sun to light shade, and fertile, well-drained soil. Due to its small size (20 to 25 feet at maturity) and fragrance, plant flowering apricot near a walkway or entrance where you can enjoy this unique tree as you come and go on a cold and wintry day.